It looks like I have a lot painted already. The cow went fairly smoothly. Hard to see from the image, but I used some pinkish browns and light blues for the highlights on his coat. I can tell it will get tougher from here. I like to think of myself as a wildlife artist. Wild places, wild animals. Horses and cows never held the magic for me like leopards, elk, sandhill cranes, and ptarmigan. What would be the magic in painting a cow? 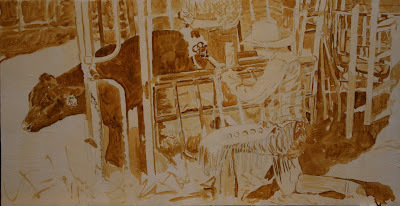 That is until I spent some time looking at Terry Miller's blog and the amazing magic he creates from everyday scenes of cattle and horses. Finding the beauty in what most of us would find mundane and then helping us see that beauty is a real talent. If you haven't checked out his blog, see the Link at lower right. 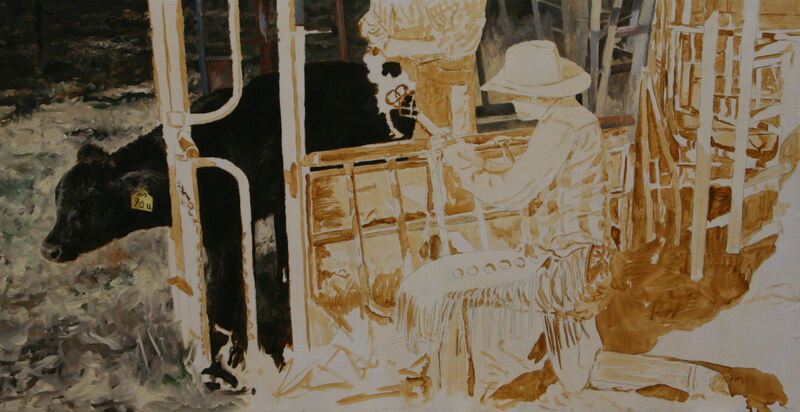 Well, I have a western themed show coming up (San Dimas 35th Annual National Western Art Exhibition and Sale) and felt it was time take a "ride on the ranch." I could just bring North American wild animal paintings, but why shy away from a challenge? I'm goin' west. Over the next week or so, I'll show you the progress on this piece. It is 12" X 23" and I can already tell that I bit off quite a chunk. Below is the turpentine wash over my drawing. The David Shepherd Wildlife Foundation has announced the Shortlisted Artwork for Wildlife Artist of the Year 2011. My painting The Return was chosen for the list and selected for inclusion in the exhibition opening June 6th at the Mall Galleries, London. I am thrilled to be part of this august group. As I think about the title to this piece, it has a couple meanings. 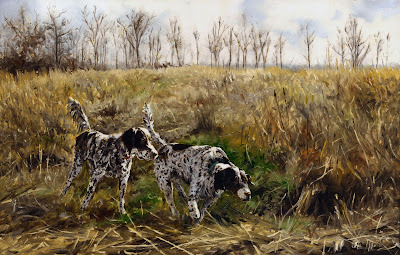 The English setters are obviously working as a team, but the painting is also a team effort. It was commissioned by the dogs' owner. He wanted a piece with both dogs in the midwest setting in which he and they hunt. I wanted some time with the dogs and a number of reference shots from which to work. The owner brought the dogs up to my house and after an hour or so, I had taken more than 420 photos. With free rein to play with composition and concept, I was able to let my imagination work through numerous possibilites to capture these two male setters. The owner was quite pleased with the result, a painting of true Teamwork. Yesterday on my way back from Natureworks in Tulsa, Oklahoma, I had a chance to swing by the Platte River in Nebraska. I took exit 305 from Interstate 80 in search of Sandhill cranes. I found them, boy did I find them. In about 3 hours, I probably saw close to 20,000. There are numerous guided tours of the area both near sunset and sunrise, but I have found that driving the country roads enables me to see them without feeling rushed. I took lots of reference photos, but I did something even more important. I listened and watched. 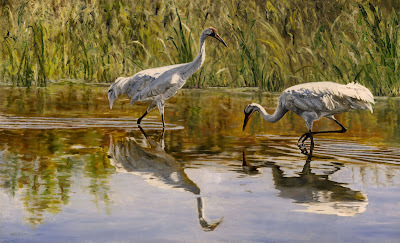 Pulled off the side of the road, driver and passenger windows down, I listened to the crane's ancient call. The variation in the different vocalizations. And I watched them dance. It seemed they leapt more than their full height, often kicking out at such an extreme angle leaving me momentarily wondering if their legs would get back under their body in time. They always did. The grass toss was fascinating to watch. Large clumps of vegetation would be thrown into the air along with the leaping. Often the clump would be thrown backwards over the crane's head. An encounter like this I find even more inspiring because I put down the camera and took those moments to listen to their calls and watch a dance which has been repeated for well over 2 million years.